It's easy to get lost in CAVE2. The next-generation virtual reality platform is one of the most advanced visualization environments on Earth. It combines 320 degrees of panoramic, floor-to-ceiling LCD displays with an optical tracking interface that gives rise to a "hybrid reality system" capable of rendering remarkably immersive 3D environments — whether you wish to explore the labyrinthine vasculature of the human brain, or soar swiftly over the vast canyons of Mars. As its name suggests, CAVE2 is a sequel. Developed by the Electronic Visualization Laboratory (EVL) at the University of Illinois at Chicago, the "hybrid reality system" is a direct followup to the original CAVE — a small, cube-shaped room that debuted way back in 1992. Like its predecessor, the "AVE" in CAVE2's name stands for "automatic virtual environment" (the recursive acronym's "C" stands for "Cave"). But that's pretty much where the similarities end. Everything about CAVE2 is big. A cylindrical enclosure, it measures 24 feet in diameter and 8 feet tall. Its interior surface is lined with 20 strategically placed ambisonic speakers, and covered floor-to-ceiling with 72 3D LCD screens. Said panels give you a 320-degree view and output at 37-megapixels each in 3D (7,360 x 4,912 pixels, or twice that in 2D), giving rise to a pixel density on par with that of the human eye's angular resolution at 20/20 vision. Headgear is required for 3D mode, in order to parse the stereoscopic imagery coming from each screen; its position is pintpointed by a 10-camera optical tracking system. The entire setup is powered by 36 high performance computers, and allows for user-controlled immersion by virtue of a hand-held wand. While the original CAVE constituted a dramatic first step in the field of virtual reality, its recently unveiled descendent brings the potential of immersive VR environments into unprecedented focus. The parallels between CAVE2 and Star Trek's Holodeck, or the parlor walls envisioned in Ray Bradubury's Fahrenheit 451, are immediately obvious, and far from accidental. The project was led by EVL director Jason Leigh, who is dressed as a Jedi in his official headshot, and clearly identifies with CAVE2's futuristic, science-fictional side. But the computer scientists behind CAVE2 emphasize it was also designed with immediately urgent real-world applications in mind. "In the next five years, we anticipate using the CAVE to look at really large-scale data to help scientists make sense of that information. CAVEs are essentially fantastic lenses for bringing data into focus," Leigh said in an interview with AP's Carla Johnson. The applications, claims the introductory video featuredhere, are virtually limitless, and could impact fields as diverse as space exploration, archaeology, architecture, and medicine. "You can walk between the blood vessels," said neurosurgeon Ali Alaraj, recalling the first time he used CAVE2. "You can look at the arteries from below. You can look at the arteries from the side. ...That was science fiction for me." "It's fantastic to come to work," says Leigh. "Every day is like getting to live a science fiction dream. To do science in this kind of environment is absolutely amazing." 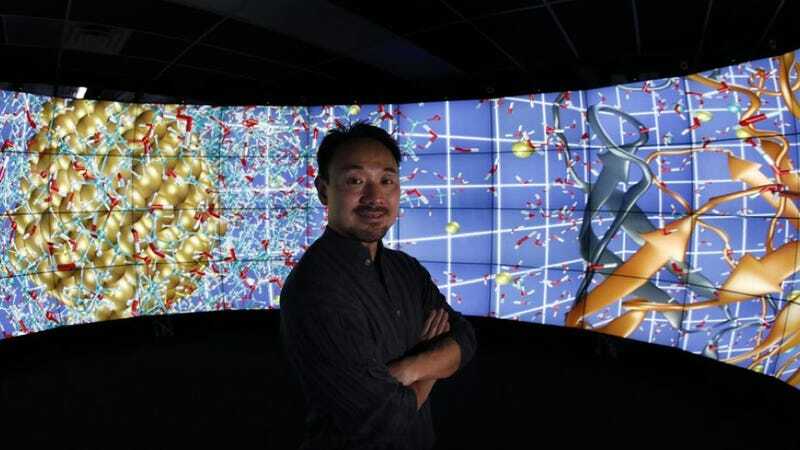 Read more about CAVE2 at UIC's Electronic Visualization Laboratory.